Traditionally insulated, vented crawl spaces are a common and burdening situation for many homeowners. No matter how well fiberglass insulation is installed in an attic ceiling, it will eventually fail and succumb to gravity and moisture laden air. Fiberglass batt insulation is unable to create a vapor/air barrier, and will allow dirty air in your crawl space to enter your home. The living space of your home can be infiltrated with mold, earth gases, rodents and other allergens if your crawl space is not properly sealed. All entering your home through your vented crawl space, and accelerated through the stack effect. The only material that can achieve a fully seamless and monolithic seal, in a crawl space, is spray foam insulation. In order to accomplish an effective seal, we lay down a 12 mil poly liner on the crawl floor and attach it to the walls. Closed cell foam is sprayed in the joist ends and down the walls, overlapping the poly liner and creating a fully monolithic sealed crawl space. Due to the use of wire insulation hangers, fiberglass insulation can often be compressed when it is installed. Insulating open web floor trusses or quiet floor beams properly with fiberglass is nearly impossible since fiberglass isn’t manufactured to fit these joist spacings and air flows easily through the fiberglass. A traditional vented crawl space allows the hot humid air outside, access to your crawl and the wood floor structure, which can lead to mold, condensation, and a decaying floor system. A spray foam conditioned crawl space eliminates this possibility, by moving the insulation envelope to the exterior crawl walls, thereby keeping your wood floor structure in a conditioned space and keeping the hot humid air out. Crawlspaces can be insulated two ways: insulating the ceiling for a vented crawlspace or insulating the walls for an unvented crawlspace. Spray foam insulation can be effectively utilized in both ways to help address common problems associated with uninsulated or poorly insulated crawlspaces. A properly insulated and sealed crawl space is one of the fundamental elements of a comfortable, healthy home. Crawl spaces have long been insulated with fiberglass batt insulation, but modern building science reveals the downsides of that practice. Ideally, crawl spaces should prevent air from infiltrating a home, so as to reduce drafts and improve air quality. Spray foam insulation can provide a more uniform, consistent thermal barrier as well as provide an air and moisture barrier. Fiberglass batt insulation cannot control or prevent the movement of air or moisture because it is a porous material. So even if your crawl space is supposedly properly insulated with batts, they will not prevent air from leaking out of or infiltrating the living space of your home. If the crawl space in your home is not fully sealed, there is a strong likelihood that airborne contaminants, mold, rodents, and more can enter your living space. Batt insulation is often compressed during installation due to the use of wire insulation hangers. Open web floor trusses create additional problems such that they create pathways for air to move around the batts. During the summer, warm and humid air can flow around the batts and create condensation, mold and decay problems in the floor system. Open web floor trusses are virtually impossible to adequately insulate and seal with batt insulation. Spray foam insulation in the crawl space is a superior insulation product that overcomes several disadvantages of other insulation products. 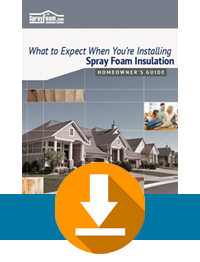 Spray foam circumvents typical insulation problems through its ability to completely fill voids and open spaces, resulting in a complete, essentially uniform insulation envelope. It is our opinion that even though a conventionally insulated fiberglass crawl space passes a home inspection, it is absolutely the worst way to go about properly insulating a crawl space. Remember, building to code is the lowest safety limit building allowed by law. We compare building to code to getting a “D-” on a test. our priority and we take pride in our commitment to quality and service. Our sales and operations staff are spray foam experts that have been properly educated in the building science concepts, with over 80 years combined industry experience. Polypro applicators are thoroughly trained professionals that specialize in installing SPF correctly and rapidly and have the benefit of using the newest and most up to date equipment.